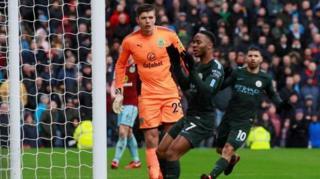 Premier League leaders Manchester City don drop points as dem play 1-1 draw away for Burnley. Johann Berg Gudmundsson equalize for di home side after im jab cross from Lowton wey fly pass City goalie Ederson. Left back Danilo bin give di away side di lead for first half, and dem get so many chances to bury di game but dem miss dem. Raheem Sterling bin miss one clear chance for second half, wey for make am 0-2 before Burnley equalize. City still dey 16 points clear for di top before second-place Manchester United host Huddersfield later on Saturday.